Back in 1955, our temple decided to create an ambitious fundraising event that would introduce Japanese food and entertainment to the temple’s neighbors. The name Ginza Holiday Festival is taken from the famous district in Tokyo, which, for centuries, has been a center of shops and entertainment. Today with its brightly lit neon signs, the district still attracts millions of visitors. Our early Ginza was also brightly lit with Japanese lanterns lining the street outside our temple and featured an authentically decorated stage and traditional red torii gates at the festival’s entrances (if you visit Ginza Holiday these days, you will still pass through these original torii gates). Entertainment consisted of classical Japanese dancing, minyo (Japanese folk dancing), musicians including shamisen and koto artists, and demonstrations of martial arts, including judo, karate and kendo. At the first Ginza, we introduced our now-famous chicken teriyaki, a family recipe of an early temple member. This was the very first time many visitors had experienced Japanese culture and cuisine, and it was a resounding success. 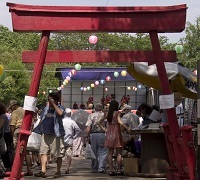 Throughout the years, the Ginza Holiday Festival has grown and become a significant neighborhood event on Chicago’s summer calendar. As part of our cultural showcase, we host exhibitors of Asian arts displaying their beautiful work in bonsai (miniature trees), ikebana (flower arrangement), sumie (painting) and calligraphy. In the late 1970s, we began a long association with the Waza, an organization of more than 100 Japanese artisans, each mastering a craft that has been handed down through their families for 300 years since Japan’s Edo period. Each year, various Waza craftsmen travel throughout the world to share their artistry and in August a small group of artisans participate in our Ginza Holiday Festival. Visitors are able to purchase samples of their unique art, which include beautiful hand-thrown pottery, delicately detailed Japanese dolls and silkscreened cloth towels often framed as works of art. Our stage entertainment continues to feature classical Japanese dance, minyo folk dance and martial-arts demonstrations. Since the mid-1970s, performances of taiko (Japanese drumming) have become one of the most popular attractions on our Ginza stage. And, recently, an evening performance of Japanese jazz by Yoko Noge and her band Japanesque has expanded our musical offerings. Although our famous chicken teriyaki is our most popular food item, over the years, we’ve added sushi, udon, teriyaki veggie burgers, corn on the cob and edamame to our menu. Most recently, we introduced SPAM® musubi, a popular snack in Hawaii that combines grilled, seasoned SPAM, nori (paper-thin seasoned seaweed) and white rice. In addition to the varied offerings of food, entertainment and exhibits, our resident minister opens the hondo (temple hall) and invites visitors to tour the temple and learn a little about Jodo Shinshu Buddhism. Visitors can also spend a peaceful moment in our new Legacy Garden, a beautiful Japanese garden dedicated in 2014. The Ginza Holiday Festival provides an opportunity to experience a different culture, connect with new acquaintances and to reconnect with old friends. Join us next August and for more information please visit our Ginza website at www.ginzaholiday.com.